Any reasonable, objective estimate of real U.S. GDP growth over the next few years comes in at 2% per year or less. But markets are expecting a Trump economic miracle with real growth of 4% and more. The cheer leaders cite tax cuts, infrastructure spending and de-regulation unleashing a wave of new economic activity. But that’s not where growth comes from. Economic growth always comes down to the sum of just two things… (1) more people working (2) more productively. Everything else means nothing unless it contributes to these two factors. Assume that the unemployment rate falls to an incredibly optimistic 2% by 2024 (from its current level of 4.7%). Built-in labor force demographics (slow population growth and an aging population) would limit annual growth in U.S. employment to just 0.7% annually. That demographic fact can only be altered by massive immigration and a new Trump administration certainly doesn’t stand for that. In Reagan’s day, the unemployment rate was above 10%; there were millions of people ready and willing to work. Now, the unemployment rate is less than half what it was in 1982. Some analysts point to the fact that there are 95 million Americans of working age who are not in the work force; all they need is an opportunity to work. This is naïve. More than 18 million have a “health problem or disability which prevents them from working or which limits the kind or amount of work they can do.” Another 30 million reportedly do not have marketable skills. Many more are at home looking after children or family members. How many are actually able and willing to work, especially at the low wages the market now offers for most jobs? Any sustained acceleration in real GDP will therefore have to come from productivity growth. That, in turn, is highly dependent on gross domestic investment (broadly defined to include investments in education and job-training initiatives to boost labor productivity). But this is the component of economic growth that faces the largest downside risk in coming years. Gross domestic investment has been trending down for decades, and the Trump administration does not seem to understand that its policy proposals will make it worse. Here’s the trend. The red line (measured on the right scale) is the annual growth in real U.S. GDP. The green line (measured against the left scale) is U.S. Domestic Investment. The impact of declining investment is clear. Turning around this dual downtrend is the work of many years. 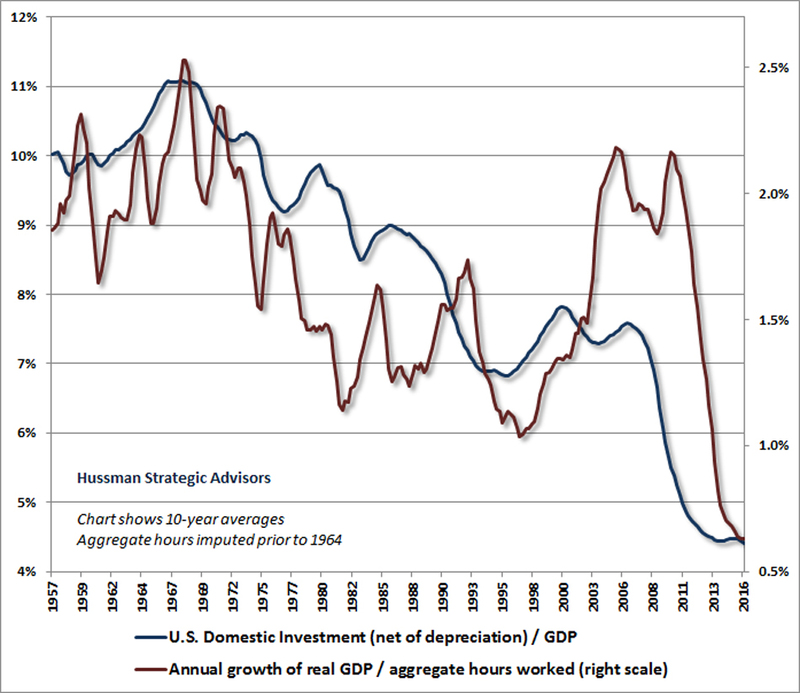 But the investment trend is not the fundamental problem. Investment depends on savings and America simply does not save enough to fund aggressive investment. U.S. gross domestic investment is always identical to the sum of: household savings, government savings (or dis-savings), corporate savings, and savings acquired from foreigners. The real problem is that weak household and corporate savings do not offset the enormous deficits that the federal, state and local governments are running, making the U.S. totally dependent upon importing foreign savings to fund investment. Here’s how the U.S. gets foreign savings. The U.S imports goods and services in excess of what it exports…running a trade deficit of more than $500 billion per year. This deficit is invested by foreigners into U.S. securities, filling in the U.S. savings gap and enabling investment to take place. In effect, we obtain the savings of foreigners by exporting securities to them, rather than goods and services. Let me say that again. By exporting more securities than it imports, the U.S. obtains foreign savings to finance U.S. gross domestic investment. Here’s the problem: pursue a policy to reduce the trade deficit and you automatically pursue a policy to reduce the import of foreign savings. Now, that’s fine if the domestic sectors of the economy are running savings surpluses. But that’s nowhere near being true. In fact, Trump is talking about increasing the Federal deficit over the next few years to fund new tax cuts and additional infrastructure spending, thereby further cutting the domestic supply of savings and increasing the need for foreign savings. The bottom line is that large and sustained increases in U.S. gross domestic investment have always been achieved by financing a substantial portion of the increase with foreign savings. Booms in U.S. gross domestic investment are always associated with a deteriorating trade balance. Trump’s war on trade simply does not support the need for foreign savings required for more aggressive investment needed to generate the higher productivity required for faster growth in the U.S. economy. There is a basic contradiction at the heart of Trumponomics. In other words, the Wall Street estimates of a Trump-induced economic miracle are complete b.s. Previous Previous post: Retail Sales Weaken: Trump ‘Bump’ Fading?